Genesis™ Performance Plus is an excellent product for race horses, jumpers, 3-day eventers and other athletes. Genesis™ Performance Plus also meets the needs of lactating mares and young growing horses. Organic Oats – The Canadian prairies finest, extremely clean and heavy clipped oats (38 lb to 44 lb oats compared to 28 lb to 32 lb oats) rich in poly unsaturated fats, primarily linoleic acid. 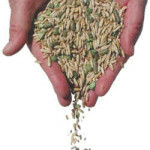 Organic Hulless Barley – Very digestible starch, high energy, low fibre product. Organic Peas – Excellent protein source, added chlorophyll (naturally attained while grazing) & higher Lysine content (an essential amino acid). 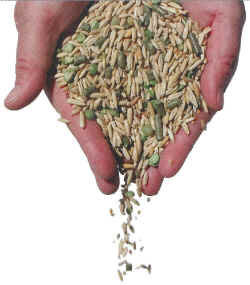 Organic Flax seed Meal – Great digestibility for performance horses. Produces less body heat when digested, which decreases heat stress and therefore increases energy for performing horses. Improved auto-immune fuction. Contains Omega 3 which is an essential fatty acid. Imparts shiny coat and prevents itching. Very digestible protein, calcium and phosphorous source. Useful anti-inflammatory properties. Decreases blood LDL-cholesterol and may prevent arthritis. Phytoestrogen source. Anti-fungal, anti-bacterial, anti-viral and anti-carcinogenic properties, as well as anti-oxidant properties. High in boron, helping the body to retain calcium. Organic Whole Flax Seed – Improved auto-immune function. Contains Omega 3 which is an essential fatty acid. Imparts shiny coat and prevents itching. Useful anti-inflammatory properties. Decreases blood LDL-cholesterol and may prevent arthritis. Phytoestrogen source. Anti-fungal, anti-bacterial, anti-viral and anti-carcinogenic properties, as well as anti-oxidant properties. High in boron, helping the body to retain calcium. Natural Supplement – Organic vitamin and mineral supplement in a base of alfalfa and peas.